There is an epidemic of students graduating from High School and from the church. What will keep the students in the faith? What will keep them interested, involved, and in the church? The cure is the development of a faith that is grounded, settled, and not easily moved. The goal of youth ministry should be to assist in the development of the student’s faith (notice it is the student’s faith, not their parents’ or pastor’s faith) to where the entrance into adult life, the arguments of secular professors, and the tragedies of life will have no affect on the student’s faith in their great God. Romans 10:13-14 – For whosoever shall call upon the name of the Lord shall be saved. How then shall they call on him in whom they have not believed? and how shall they believe in him of whom they have not heard? and how shall they hear without a preacher? Every believer and follower of Jesus Christ has been called to reach the lost. Youth ministry has a responsibility to enable, encourage, and exercise evangelism. The largest mission field in the United States right now is on the high school campus. There needs to be training for these students as they enter the battle. These students need to be taught how evangelism works. Evangelism is not something that comes easy to many students. They need to be encouraged to share their faith with others and bring their friends to church. Finally, the students need to have opportunities to exercise evangelism. Whether this is through specific outreach events or mission trips, the students need to put their faith into action. Deuteronomy 6:5-7 – Love the Lord your God with all your heart and with all your soul and with all your strength. These commandments that I give you today are to be upon your hearts. Impress them on your children. Talk about them when you sit at home and when you walk along the road, when you lie down and when you get up. “The responsibility for raising spiritual champions, according to the Bible, belongs to the parents…the responsibility is squarely laid at the feet of the family. This is not a job for specialists. It is a job for parents.” (George Barna, Revolutionary Parenting). Alongside those essential spiritual actions, there are practical aspects that need to be brought to the table. A good assistance coach will help in game planning, go to the coach when they see a player struggling or injured, and help inform the coach where they lack the knowledge. Youth ministry is no different. The youth ministry team should help the parents game plan. In other words, they should help them develop the spiritual goals for their child and allow the programs and teachings to aid in reaching those goals. Also, it is imperative for the youth ministry to go to the parents when a student is struggling spiritually. There will be times when behavior is inappropriate, words throw up red flags, or things are said in small groups where the parents need to be made aware. Then, the youth pastor can aid in the recovery process. Lastly, there needs to be parent meetings that include youth culture updates, upcoming event information, discussion/advice from other parents and other essential communication that will act as support in the parenting process. After all, it is the responsibility of the coach for the team’s behavior, but the assistant coach has a vested interest in the outcome of the game. The Bible does not say to have many programs and hope disciples will result from each event. While there are programs that are effective in that respect and reaching young people, youth ministry can easily miss the target. One significant determining factor of young people leaving the church is relationships. Recent research has supported this claim (Group Magazine, March/April 2010 & Essential Church, 37, 64-65). Teens, sadly, will not remember each Bible study and Sunday School topic, but they will remember the times where a leader or pastor discipled them, mentored them, and built a relationship that helped them grow spiritually. Discipleship, mentorship, and relationship are at the heart of youth ministry. These methods are a replica of the ministry model that Jesus Christ established with his disciples. If youth ministry focuses on the next big event and neglects the discipleship and mentoring that could be happening, it is simply spinning its wheels. The youth ministry team must establish a plan of discipleship where the leaders are forming and building relationships where discipleship and mentorship can happen. If there is no equipping the saints for ministry, the ministry can go only as far as the pastor. Equipping should happen in multiple aspects of youth ministry. In other words, the equipping should not stop at just the students, but should extend into church members, parents, and youth ministry staff/volunteers. The students need to be trained and given opportunities to serve. It should be a priority of the youth ministry team to help the student discover their spiritual gifts and talents that can be used to build up the church body and give God glory. These students need to be connected in ministry within the church body, and not just participate in ministry exclusive to the youth ministry. Similarly, the youth pastor should continually find ways where others can be trained in ministry, used in ministry, and can grow in their love to serve in ministry. The youth pastor needs to see potential in the people around him and provide opportunities for service. Also, the process should intertwine with the mentoring/discipleship process where those in ministries are consistently training and encouraging the next generation. Psalm 100:1-5 – Shout for joy to the LORD, all the earth. Worship the LORD with gladness; come before him with joyful songs. Know that the LORD is God. It is he who made us, and we are his we are his people, the sheep of his pasture. Enter his gates with thanksgiving and his courts with praise; give thanks to him and praise his name. For the LORD is good and his love endures forever; his faithfulness continues through all generations. The youth ministry needs to be an environment where the Creator of the universe, the Almighty God, the Savior of all mankind can be worshiped. Therefore, the music, teaching, conversations, social interaction, small group time, programs, and leadership team all need to advance and promote worship and not detract from it. The youth pastor is responsible to maintain a spiritually healthy environment where reverence, respect, glory, and praise is given to the Father. The Good: It was refreshing to have a new author for each challenge, bringing a new perspective on what is important in fatherhood. Each unique look provided a new challenge, from a different angle and background. Honestly, that kept me going in the challenge, knowing there was a new author’s perspective around the corner. The book does a good job of balancing Scripture with the principles laid out. Also, the homework at the end of each chapter was very helpful, and allowed for the reader to have the proper takeaway for each chapter. Finally, it was doable. The challenge took about 15-20 minutes each night to both read and complete the homework. The Bad: Some of what I am going to say seems unfair, but here it is. The multiple authors resulted in some repeating of information. I know it’s not their fault, please stop yelling at me. Also, it did not cater for the ages of my kids (very young) as well as I thought it might. I had trouble with some of the homework assignments as a result of the ages of my kids. Again, not the book’s fault. Told you it was unfair. Listen all you dads out there, I think you can spare 15 minutes a day to read a chapter of this book. It is worth your time to do that in a 21 day period. 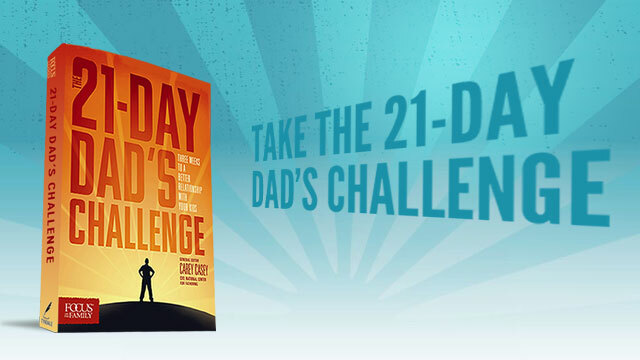 Challenge yourself to be a better dad. This country is starving for some male leadership in the home, and you should be eagerly looking for books like this to challenge yourself and make you a better dad. Do it for your kids. Do it for the Lord. And do it for your grandchildren that will have your children as parents. This decision to read this book could affect many generations…not many books you could describe that way, huh? So go take the challenge.